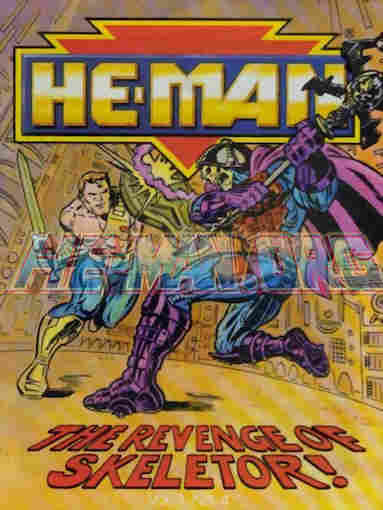 Tomorrow we’re taking a look at the last of the He-Man newspaper comic strips, which takes place during the He-Man toyline. For those of you who can’t follow, the toyline you’re thinking of is Masters Of The Universe. 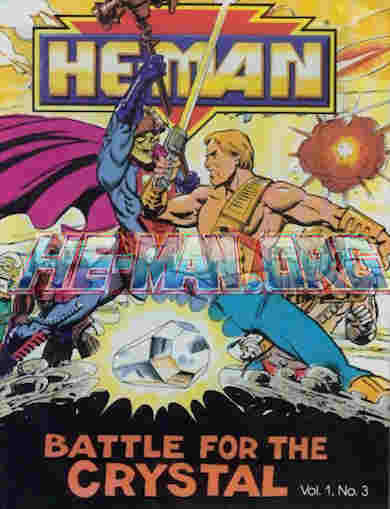 “He-Man” was added to the title of the Filmation cartoon. The actual He-Man toyline reverses the concept of the original. Instead of magic with a hint of science it’s science with a hint of magic. It was Mattel’s attempt to revitalize the intellectual property, although only He-Man and Skeletor made the trip over. Not counting the cartoon but I’ll come back to that in a later posting. While Masters had numerous comics He-Man only had four, so like the Marvel/Drakes comics I’m going to review all four tonight. This will lead into tomorrow’s newspaper trip to the distant planet of Primus, somewhere in the future. (Whether or not Primus is Eternia reborn Third Earth style was never said but I’m leaning towards no.) In all the versions the people of Primus call out for a champion as their world is attacked by the evil mutants, and that champion is He-Man. Not that Skeletor isn’t willing to mess with our hero because we all have hobbies. While I do own the first issue, all the images (to make things easier on me) come from He-Man. org. Click the link in the issue number to read along; just note that sometimes they don’t have the page order right so keep an eye on that. I’ll also use other links when discussing some of the toy-to-comic conversions because they’ve been nice enough to link to my reviews of the Newspaper comics, which admittedly the site’s webmaster worked on. No credits given for this comic so we won’t know who made it. Too bad because the art is pretty good. So how’s the story? The comic opens with a map of the important areas for our new setting, the Tri-Solar galaxy, named of course for the three suns. That must make summer unbearable. The comic also takes the chance to show off the three vehicles for the good guys in the early waves of the toyline, the Bolajet (which tosses a huge bolo–sounds like something Man-At-Arm would come up with after being overworked…then again everyone tells me the Dragon Walker is an engineering feat), the Astrosub (a jet that can go into space or underwater…although I don’t recommend doing either with the toy), and the starship to be named in a later issue. It’s with that starship that Captain Hydron and Lieutenant Flipshot will has been sending a signal throughout time and space to find He-Man. He’s not in the book after all. The problem is that an unknown enemy has been plaguing them and legend says He-Man is the only one who can save them. Compare that to whatever the newspaper comic will do tomorrow, or the cartoon where they sought “the power of the good and the way of the magic” and He-Man himself wasn’t identified. Luckily they get an answer from He-Man, but the castle holding his power is under siege and he needs them to draw it off and keep it safe until things are over. Because why would you want a starship to chase off your enemies? It’s only a highly-armed building-sized vessel that could even the odds just by landing on a few guys. Of course it’s Skeletor tricking the heroes into opening a “laser gate” to He-Man’s dimension and draining off Castle Grayskull’s mystic power. This will be a trend for these origins. In Grayskull, where if I understand the narration Adam now lives, the Sorceress appears in a spirit form, something we’ll also see when we get to the later Masters Of The Universe minicomics in this series, to warn him of Skeletor’s latest plot. 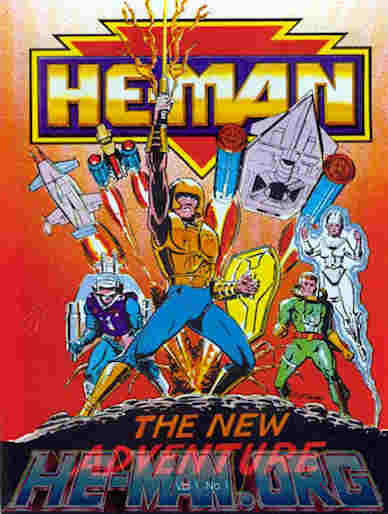 Adam call upon the power of Grayskull–even mimicking his sister by throwing in “I am He-Man” along with “I have the power”, but it doesn’t work. He’s stuck as Prince Adam…and considering my earlier discussions on the matter I want to talk about the Power Sword in these comics. They don’t match the classic toy sword because Mattel had come up with a new design, which seemed like an evolution of the last Sword Of Power they created for Laser Power He-Man, and I would love to know why the Sword, both in the designers’ minds and in-universe, would take on a more science fiction design. And yet the Sword we see in the minicomics is based on the role play toy, designed that way to allow for electronic sounds and lights. I’m not sure why they went with that. Well, Adam does, as the Sorceress pops up with her new space outfit (He-Man.org calls her “cyber-Sorceress” in at least one of their summaries), joining the powers of past and future in a burst of energy that messes up Skeletor but good…and even knocking off his hood for the first time ever. And apparently the artist thought Skeletor had skin on his head. She also declares that Adam is no more and he is just He-Man now. This was apparently Mattel’s attempt to get rid of the Prince Adam identity, created by DC Comics in their original shelf run remember, and just make it He-Man again. Nobody else followed this plan by the way. I know the cartoon ignored it and I’m betting the newspaper comics didn’t either. As the visitors bow down to He-Man and seek his aid against their mysterious enemy Skeletor takes the opportunity to escape in an escape pod into the future, ending the first issue. Nice going, guys. To make ends meet in the Tri-Solar galaxy Skeletor turned to giving dance lessons. Our heroes try to pursue Skeletor down the laser gate but start spinning out of control. Skeletor laughs about them possibly going to their doom…not realizing that if the Starship blows up all that magic will either be released or destroyed but it will be lost to him. He really did get shocked too hard. Still injured he drags himself to the escape pod’s medical bay designed for bionic replacements. No really, the sign says “medical emergencies bionic replacements”. That’s one outfitted escape pod. Does it have a second one for anti-toxins? He even upgrades the Havoc Staff to the skull-shaped version that came with the various Skeletor figures and even got an electronic role-play toy of its own. The next page gives us a new rendition of the map from issue #1 along with text stating that the mysterious attackers have stolen the Trifusium crystal that controls the atmosphere on Primus and the Galactic Council have tracked them to Denibria. As an agent heads there in the Astrosub we finally meet the villains for this series, Flogg and his band of mutants…who were supposed to steal a missile, not the atomsphere-controlling crystal. I wonder which had better security. If there’s one universal truth I’ve seen in kids shows is that security couldn’t stop a cat from entering, never mind super-powered villains. Flogg’s lieutenants, Slushhead and Optikk (a guy with a fishbowl on his head who apparently breaths water and a guy with an eyeball for a head…so you know Mattel didn’t change their design ideas), argue over whose fault it is and Flogg lives up to his name (within kids comic limits…although we have seen death in both Masters Of The Universe and Princess Of Power…mostly from She-Ra herself), causing Slushhead to drop the crystal. Yes, the all-powerful weather controlling crystal is small enough to be held. I’m surprised Primus didn’t go out like planet Spaceball years ago. Flogg is upset because that little crystal, the same one that controls a whole planet’s atmosphere, isn’t the missile he needs for his Terrorclaw vehicle and I’m guessing we aren’t getting a villain with brains here either. You’re about to wipe out all your enemies without breathing hard. How hands-on do you want to be? One of Flogg’s men picks up the Astrosub and Skeletor’s pod. Figuring they have hostages, he sends his men to get them. They find the soldier first and capture him. An inconvenient call from the Council alerts Flogg to what was actually stolen, so he didn’t even know what he had. Then because Flogg is one of those leaders who doesn’t listen to his men warning him of something Skeletor’s pod crashes into them, giving the trooper a chance to escape. Skeletor comes out of the pod, and Flogg tells him to kneel to his new master. If you know anything about Skeletor I shouldn’t have to tell you what happens next. He-Man is here for those dance lessons. Meanwhile our heroes are still out of control. The Sorceress tells He-Man to tap into the stolen Grayskull powers, but he needs to use the name of the ship rather than the castle. The ship’s name is Eternia, based on the legend that drew them to He-Man in the first place. This keeps the planet’s name in the lore at least but it kind of pushes Grayskull out of the picture. I’m not sure why he still needs the full “by the power of Eternia…I have the power” thing if he’s just turning the engines on. Sorceress leaves or breaks communication or whatever she does, and the Starship is transformed to space station mode (which the toy could do) to better effect repairs…which is just a crack in the hull apparently. They get the call from the Astrosub calling for back-up and head to join the Bolojet to intercept. Because what’s essentially a flying motorcycle that fires oversized bolos is perfect for space travel. Did the writer actually see these toys? The artist already thinks Skeletor’s head had yellow skin on it. Our still unnamed pilot, later identified as Kayo (and good thing they name him here because his figure was one of the ones that came with this issue) is actually holding his own against Skeletor and friends in their Shuttle Pods (that’s the other enemy vehicle at this point in the toyline, a spacefighter) until help arrives. Galactic City calls the Eternia to warn them about the stolen crystal in case the readers didn’t get one of the figures that came issue #2. Kayo docks with the starship and tells them he found the crystal and he and He-Man beam down to the planet. As they arrive they’re ambushed by Skeletor and the mutants, old bonehead even dumb enough to bring the crystal with him rather than lock it up somewhere so he can taunt He-Man. Only been with him a half hour and already Flogg’s stupidity is rubbing off on him. Then he just tosses it away so he can escape when the Bolojet and Eternia arrive. It looks like He-Man can get a power boost from the mystic energies in the Eternia with his altered incantation. I guess the power of Grayskull has been a bit inconsistent between continuities. Skeletor and Flogg got away but Optikk has to start the comic he came with tied to Slushhead, the two still bickering. I’m guessing the slashfic community has already worked with these two but for the love of Procrustus NEVER TRY TO SHOW IT TO ME EVER!!!!!!!!!!!!!!!!!!!!!!!!!! Sorry. A bit skeeved out at the very notion. Moving on. It doesn’t matter anyway as Skeletor teleports both them and the Terrorclaw away, as he plans to get to Primus first. We’ve already seen this thing is way too easy to steal. Just wait a few weeks and go after again. It’s not like their most important handheld rock was well guarded to begin with. And apparently they’re pretty fast too because it only takes them as long as the distance back to the Eternia…via teleporter I remind you…for Titus, the city that the crystal has to be returned to, to lose contact. They even flash back a bit to show it happen. Four guys at the observatory, easily beaten. No wonder they called He-Man. These guys couldn’t protect a hatbox. Skeletor even gets on the radio finally to call for help just to rub it in that Primus is about to pull a Krypton. “Primus” and planets don’t go together safely. Just as the Autobots. He-Man and his Galactic Guardian friends race towards Primus. Of course there’s an ambush waiting for them but as Hydron, Flipshot, and Kayo are the only actual fighters there’s a bit more resistance. He-Man runs to put the Trifusium crystal back in the machine Skeletor shows up to stop he. He-Man calls upon the power boost of Eternia and knocks him aside, putting the crystal back in place just in a nick of time. I’m not sure I want to live on a planet that will explode without a crystal the size of an ice cream cone but I don’t understand the population of Gotham City either. The day is saved, the villains escape to the skull-shaped moon of Nordor (if you can’t have the skull castle, you might as well settle for a skull moon), and kids have a new adventure to play. These were the only minicomics created for the line although it would go on to have many more action figures. They would need the cartoon to get their stories told. The minicomics themselves are actually pretty good. Each leads to the other with a decent cliffhanger, so kids will scramble to buy one of the figures with the next issue inside. If they like those, why not buy the other figures and vehicles. Of course if you didn’t get into the figures, and I only bought my He-Man figure out of curiosity back in the day (and broke the Sword at the translucent hilt), you miss out on a decent story. The set-up is well told but the adventure itself stands alone nicely. It showcases the toys–I mean characters and vehicles by giving them an adventure that can spark a kid’s imagination. They’re worth reading if you have the chance. Tomorrow we’ll see what the newspaper strips did with this idea and next time we’ll check in on the children of that other Primus I mentioned with our first look at Transformers Energon the minicomic. 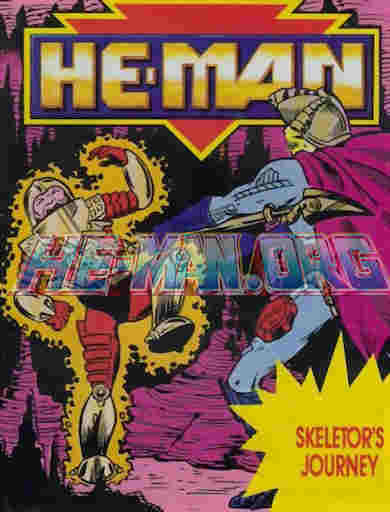 Posted by ShadowWing Tronix on March 28, 2019 in Free Comic Inside and tagged Free Comic Inside, He-Man, mini-comic, Minicomic, promotional comics, Skeletor, The New Adventures Of He-Man. This is the first time I have seen any creative work on He-Man being in outer space of the future. It’s an interesting concept for sure. Very different though, as here it truly feels more like science fiction instead of the fantasy concept of the earlier Masters of the Universe on Eternia. Thanks for posting the links to He-Man.org, so that we could read the actual mini-comic book pages. I read those first, and then read your written summaries for a thorough understanding of this four issue mini-comic mini-series. But I wonder why the Sorceress changed form to look like one of the Silverhawks?????? Also, why do the mutants (the bad guys) in this series have to be such bumbling idiots? Finally, why does there just happen to be a skull shaped moon? Other than those minor gripes, I did enjoy reading this four issue mini-comic series of He-Man in Outer Space!